Mama Manifesto: Why is it..
That if I want to run into the grocery store to buy ONE THING I have to be prepared with snacks, sippy cups, time outs and drama? 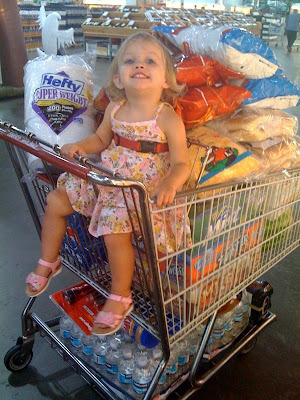 But when Lulu shops with Dad for a huge youth group event he can buy this much stuff, fit it perfectly in the cart and get her to take a silly picture too. It's not fair!!! Maybe we shouldn't bring all the snacks and sippy cups..could that be it?? My husband shops like he is on supermarket sweep (that old show) minus the all out running. 30 items on his list.....he's in and out in 20 minutes. No getting side tracked, no crazy dilemmas over the orange scent versus the fresh scent. I think kids realize this difference between their parents.....they dont't have time to get bored while in Daddy's shopping cart, he's too fast!! My hubby and I have this talk a lot. Like when I get up with the kids (29 out of 30 mornings) the kids need milk and dry cereal immediately. That's our pre-breakfast. Then the second their show ends they are at the table for real breakfast. Well, when my hubby gets up, I'll come down an hour later and no one is fed, there thirsty, and he's watching the news. I think it has to do with expectations. Mommy cares for me everyday. Mommy plays with me, why is she cleaning the bathroom? Dads can change it up due to the time they spend at work. The kids know I am a sucker too. I am just not brave enough to go anywhere without my kid bag o tricks! I'm not that good a mommy...yet.